The ordination and consecration of the Revd Canon Dr Guli Francis-Dehqani as the first Bishop of Loughborough took place at the Cathedral today (30 November 2017). The service led by the Archbishop of Canterbury, the Most Revd Justin Welby, was attended by bishops, family and friends of Bishop Guli and members of the Leicester Diocese and the Chapters of Canterbury, Peterborough and Leicester Cathedrals. Bishop Guli was born in Iran in 1966 and her early faith was nurtured in a small Persian Anglican community. The church, led by her father as Bishop, was hit hard by the events of the 1979 Islamic Revolution and the cost for the family was great. Her brother, Bahram, was murdered in Tehran in 1980 at the age of just 24 and he is remembered in Canterbury Cathedral’s Chapel dedicated to Saints and Martyrs of Our Own Time. The congregation heard the Cathedral Choir sing words from St John’s Gospel and lines from a 14th century Persian poet set to music composed by Bishop Guli’s 17-year-old son, Gabriel. The Old Testament reading was in Persian and the congregation sang the Persian translation of the refrain of the final hymn, Thine be the glory, risen, conquering son. Prior to her consecration Bishop Guli has been working as Curate Training Officer in the Diocese of Peterborough and for the past five years has been on General Synod and served as adviser for Women’s Ministry. 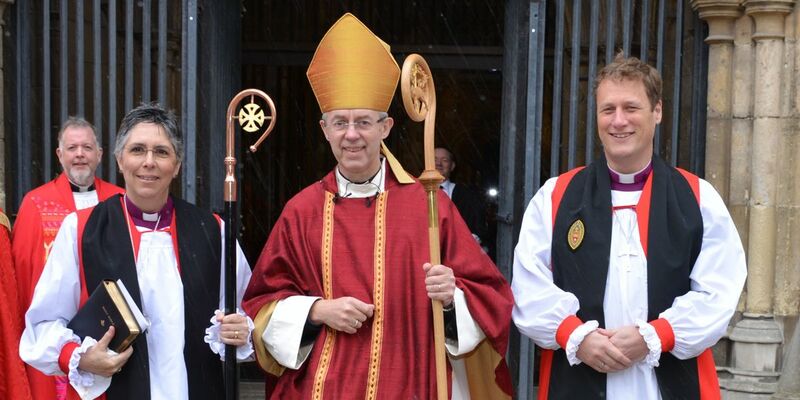 Bishop Guli (left) is pictured with the Archbishop of Canterbury, the Most Revd Justin Welby and the Bishop of Leicester, the Rt Revd Martyn Snow.